Laser technology in various industrial uses is not a new feature. But, in dental practices in India, laser beams are somewhat recent introductions. A laser is basically an instrument, which is able to produce very narrow beam of light, with high intensity, which produces a reaction in the tissues, when they come in contact. Use of laser dentistry first started in 1990 and since then, it has become quite efficient in treating various kinds of diseases in the hands of dentists in Delhi as well as in many parts of India. 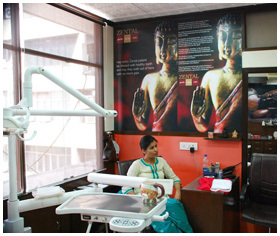 Our clinic in Delhi also has plenty of patients, who are being provided with advanced techniques of laser dentistry. This is a high energy light form, which can be used to create heat and sometimes cold with cold lasers. Nowadays, dentists in India are using the laser dentistry treatment Delhi to work on some important problems, which are also common issues with people. Tooth decay is a common problem among many patients, starting from children to the adults. By means of laser dentistry being done in clinics in India, the decay or debris are removed and the tooth is made ready to accept the filling material. Sometimes, dentists in Delhi also use lasers to cure or make a filling hard. Gum diseases of different types are treated with laser therapies, by dentist in India. With the help of the laser instrument, directed on to the gums, they can be used to remove the infections and germs from root canal treatments and laser can also be used to reshape the gums. Biopsy removal from the oral cavity is done by help of laser in some dental clinics of India, while we make it a point to use the laser therapies for diagnostic purposes. Biopsy can be taken out and lesion in the gums can be removed by using laser, such as in case of canker sores. Laser teeth whitening of the stained teeth is one of the common uses of laser in dental practice in India. Plenty of people are trying to get glistening white teeth, for which the laser beams can be quite useful. We have the best system of high quality laser beams, where bleaching of the gums and teeth is possible in quick time and most advantageously, without pain. Laser dentistry has plenty of advantages to offer for the patients as well as dentists in Delhi. Since, this procedure allows for outpatient dealing with various kinds of cases, it is not necessary for admission of patients. by present time, it has been well known to many people that the laser therapies are usually quite painless and can be utilised by dentists in Delhi for handling variety of cases. No surgeries or interventional methods are necessary, when laser dentistry is being carried out. For this reason, many people do not feel the need to be administered with anaesthesia. Drilling machines for root canal treatments and for other jaw bone processes are not necessary. Precision is an important parameter for the advantage of the laser therapies in dentistry. After the laser therapy has been utilised in a particular area of the oral cavity, the healing time is drastically reduced. Symptoms of pain and burning are not seen, while the drugs required for their control are curbed. During surgeries, laser dentistry in Delhi also prevents any bleeding from the gums and post surgery infections are also reduced as the laser beam also works as an antiseptic therapy. There is preservation of healthy tooth during cavity removal, when dentist in India uses the laser beams. In our clinic for laser dentistry in Delhi, it is quite commonly utilised in many diseases of the tooth and jaw, as well as oral cavities. To make this possible, dentists in India are going for training in the use of laser instruments. Various seminars and workshops in foreign countries are being regularly attended by these dentists, so that they know the intricacies of use of such instrument. Further, it is also the clinical skill and knowledge of Delhi dentists to utilise the laser beams in the right disease conditions. Patients are usually concerned about the safety of the laser procedures. To give them the confidence, it has to be assured that the dentists are well trained, which is the practice in our dental set up. Most of the dental specialists are trained in using dental laser instruments. Some people can also wear protective glasses, while the procedures are being undertaken. Various certified courses are offered in India as well as in foreign countries, where the dentists are going for their training. This assures our patients about the kind of treatments that they would be receiving for different conditions of their dentition. Dental procedures like laser teeth whitening, conducted with the help of laser beams, are gradually getting cheaper. Although the laser instruments in our clinics are brought from reputed companies, the cost reduction is because of the use of such instruments in as many cases as necessary. With more and more people opting for laser therapies, it is an encouraging prospect for people to get this kind of treatment done in quick time and at low costs.